At the end of January 2011, the U.S. Department of Agriculture (USDA) and the U.S. Department of Health and Human Services (HHS) released new Dietary Guidelines for Americans (referred to herein as "DGA"), see HERE for those guidelines. The USDA and HHS have jointly published the DGA for Americans every 5 years since 1980. Naturally, there were some headlines about the new guidelines, notably that Americans should eat fewer calories and reduce their sodium consumption. The DGA recommend that healthy adults should limit sodium intake to 2,300 mg per day while individuals with high blood pressure should consume no more than 1,500 mg per day. During the January 31, 2011 news conference when the new dietary guidelines were released, USDA Secretary Tom Vilsack said "We know today the average American probably consumes 3,400 milligrams of sodium, so this is a fairly significant effort on our part and it must be reflected in the decisions that food-processing companies, in particular, make over time so folk don't necessarily reject out of hand these guidelines because the taste is so fundamentally different." Still, one has to wonder how long THAT will actually take? Reducing sodium consumption is a tad more complex than asking Americans to stop using their salt shakers. The U.S. food industry has promised for decades that it was doing all it could to reduce sodium content, yet the average American's sodium consumption has increased dramatically over over the years. That's mostly because the sodium content is already far too high before Americans even open their packages of prepared foods, and/or their restaurant meals and/or take-out foods. The sad reality is that it's really not American consumers, but the U.S. food industry that's so hopelessly (helplessly?) addicted to sodium. 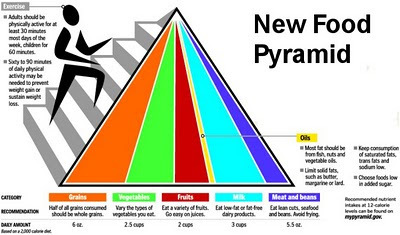 That's who has to change their food pyramid, but we shouldn't hold our breath waiting for any radical changes from them anytime soon short of U.S. lawmakers mandating it. Beyond the salt issue, the DGA also recommended that Americans eat less overall for the first time ever, which was perhaps the most radical change in the guidelines. Still, a study recently published (in the February 15, 2011 edition) in the International Journal of Obesity found that most parents and older children noticed calorie counts posted in New York City fast-food restaurants (as mandated by the New York City Department of Health and Mental Hygiene, but since copied by a number of other counties and/or states across the U.S.), but having access to that information prominently did not seem to stop them from ordering their favorite burgers and fries. It seems that by the time consumers have entered the restaurant, they've already decided what their meal (or the meal for their child) is going to be. It is not known whether adults behave in the same way, however, since the study did not examine that population. All of that is pretty much old news, but certainly none of it is groundreaking news. But last week, there was some groundbreaking news on the U.S. DGA that hardly any media outlets and/or diabetes bloggers even caught. The organization cites the government's "conflicts-of-interest and arbitrary and capricious behavior in developing nutrition advice that was supposed [emphasis mine] to help Americans fight record obesity levels." The group claims the main issue is that the new dietary guidelines' use what they call biochemical terms, such as "saturated fat" and "cholesterol" instead of specific food terms such as "meat" and/or "cheese," a deliberate omission that can be traced to the USDA's close ties to U.S. food processing and restaurant industries, including fast-food companies such as McDonald's. Their lawsuit demands a complete rewrite of sections of the DGA that use such technical terms which the group claims is to avoid mentioning the specific risks of meat and dairy products. The lawsuit also raises concerns over the Dietary Guidelines Advisory Committee members that have ties to the food processing and restaurant industries, including a member who served on an advisory council for McDonald's Corp.
"While the Guidelines do acknowledge the healthfulness of plant-based diets, they also employ confusing euphemisms like 'solid fats' to avoid being clear about the health risks posed by meat and dairy products," PCRM nutrition education director Susan Levin, M.S., R.D. said in the organization's press release (noted above). "Americans need straightforward health advice, not bureaucratic mumbo jumbo designed to protect agribusiness." Now, adopting a vegan diet is viewed as a bit extreme, even for a fair number of vegetarians who believe that a vegetarian diet can and should be lacto-ovo (including dairy products and eggs), not only for health reasons, but also for dietary flavor and variety. Notably, a 1999 meta-analysis of 5 studies comparing vegetarian and non-vegetarian mortality rates in Western countries actually found that the mortality rate due to ischemic heart disease was actually 34% lower among lacto-ovo vegetarians (vegetarians who eat dairy products and eggs) and pescetarians (those who eat fish but no other meat) than it was for vegans. But regardless of your opinion on vegan diets, there is no denying that vegetarians are generally healthier than carnivores according to most research that have compared the two groups. But the group's lawsuit was a first to challenge the new U.S. DGA, and the committee who helped assemble the new dietary guidelines. The outcome of the lawsuit will be decided in the courts, but if even if it proves unsuccessful, the group has raised yet another issue of conflicts-of-interest among government agencies that are supposed to be free of outside influences when making their decisions. Stay tuned to the PCRM's website for the outcome! PCRM is an extremest group allied with PETA that dispenses misinformation demonizing meat. They regularly send letters from out of state to our newspaper regularly filled with scary, near-hysterical "meat will kill you" health claims that are not based on research. It's founder is Neal Barnard whose MD is in psychiatry, which he doesn't practice, and whose dietary advice for people with diabetes, spread in his bestselling book, is toxic and based on his religious/dietary beliefs not science. The studies that his followers cite are carefully cherry picked and are the usual studies that compare the vegan diet to a Froot Loops diet which is the only way you can make it look healthy. In fact, the soy-based vegan diet does very bad things to thyroids over time and vegans may also be more prone to autoimmune disease than others in the general population (perhaps because the soy damages the gut, allowing proteins through.) Most of the people I've known who have died young of cancer in this region were fanatical vegetarians. 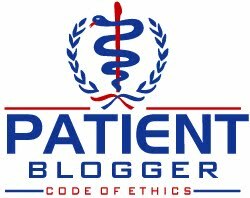 It would be nice to see doctors standing up to the FDA, but the doctors of PCRM are one step away from Scientologists. For people with diabetes PCRM is yet another group working hard to keep them from learning how to manage their disease. I find it a tragedy that Barnard's book has gotten so much exposure. I hear from a lot of people thanks to my web site, but I don't hear from people who have achieved normal blood sugars eating the high carb plant based diet he recommends. I believe you and as I noted, many vegetarians themselves find a vegan diet to be extreme (hence my reason for noting that). I do wish some less extreme groups of doctors would challenge these guidelines as well, but frankly, many groups of doctors are as beholden to the "establishment" as the government itself. For example, the American Association of Clinical Endocrinologists (AACE) is one of the most Republican-leaning organizations in existence, and has even invited such extremists as Ann Coulter to speak on their behalf. They are more concerned about reducing the tax liability of their members (at the expense of lower-income Americans) than they are sound policy impacting their "trade". The American Medical Association (AMA) is almost as bad (but not quite). Still, any legal action that raises the profile of the widespread conflicts-of-interest that are so prevalent throughout Government agencies is a good thing from my perspective -- I only wish it weren't extremists leading the charge.